We are back at Waddesdon Manor (National Trust) for another season with the Pagoda mynahs. Thanks so much to Ian Edmans and the team at the Aviary who have been so supportive. The standard box design seems to be very well received, with a 45mm entry hole instead of the standard 32mm, and the addition of a perch. (We must get some starling boxes out next year!) 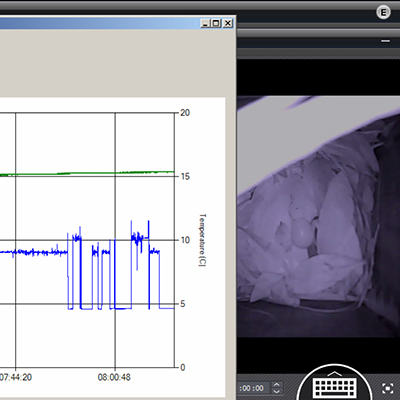 We are running live graphing in parallel with the video, which shows the previous hour’s weight data. Even video can seem a bit static when the bird is sat on the nest, so being able to see an overview of the previous hour’s activity adds a significant additional interest. 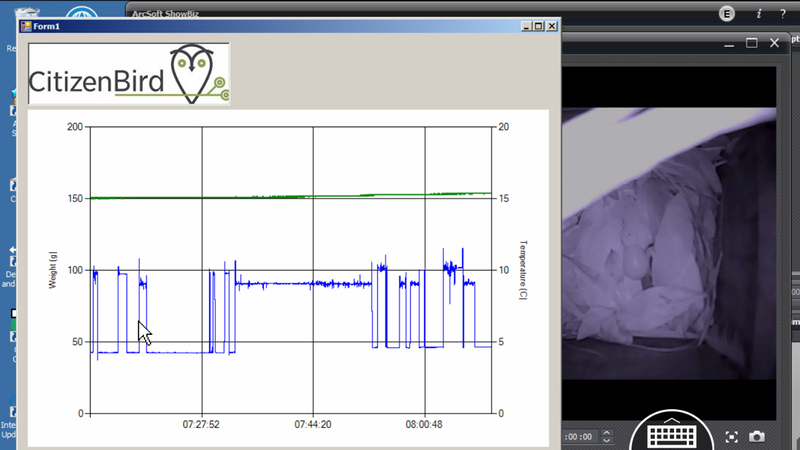 The graph in the screen shot above shows the moment when the first egg (pictured in the video camera still, right) was laid. The female, which is the lighter of the adults, enters the nest box at 07:32am. When she next leaves, at approximately 07:53am, the nest weight has increased from 41.9g to 45.3g giving an egg weight of 3.4g.